The Philips SpeechOne is a brand new, state of the art wireless headset designed for the most accurate results with Speech Recognition and hands-free dictation. The SpeechOne is simple and intuitive to operate and ergonomically designed. The SpeechOne Headset is also completely symmetrical to allow users to wear the headset on both left and right ears. This headset also includes an inductive docking station for fast charging and safe, stylish storage. This Kit (PSM6800) includes Philips SpeechExec Pro Dictate Software. Superior Audio Quality - for the very best Speech Recognition results, even in noisy environments. Hygienic Working - with an antimicrobial housing, ideal for medical environments or when sharing the device with other users. 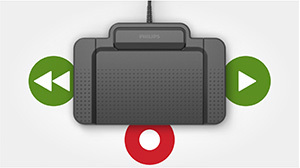 Smart Backwards Compatibility - works with existing SpeechMike integrations, Philips software and third party software. An optional foot control (ACC2300 series) can be connected directly to the docking station and used for comfortable, hands-free recording control. Use the options near the "add to cart" section on this page to purchase a compatible footpedal. After great anticipation we are enthralled to get our hands on the brand new Philips SpeechOne Wireless Headset. The SpeechOne, dock, remote and status light all have a clean, attractive build quality and feel robust enough to withstand day-to-day use in a variety of office environments. Philips have really made an impression on ourselves with the SpeechOne's patented Lossless Audio Transmission Technology; when played back-to-back in comparison with files transferred via Bluetooth and DECT the sound quality was clearly superior in terms of clarity, volume and frequency range - perfect for use with Speech Recognition! We also found that the headset was comfortable to use over long periods of time, with the docking station and remote control providing ideal companions to take full control of our workspace. Editing documents via voice with the SpeechOne and remote control was simple, intuitive and enjoyable. In conclusion: a fantastic headset with superior audio quality, easy to use with many impressive, professional features. We can see this being a firm favourite for ourselves and our customers!